John Loeb has been growing grapes in the Russian Riverbend and Alexander Valley of Sonoma County, California since 1973. He has spared no effort to produce the highest quality wines possible. Sonoma-Loeb wines have garnered prestigious awards and consistent high scores from the Wine Spectator and Robert Parker. 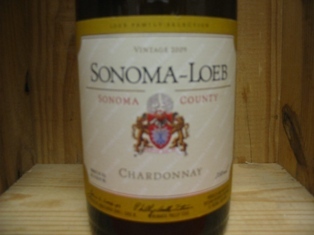 Sonoma-Loeb�s �fragrant, lavishly rich, buttery, honeyed, full-bodied Chardonnay� mirrors the fine Burgundy wines Ambassador Loeb set out to make. Sonoma-Loeb grapes have been purchased by many of California�s leading wineries and have contributed to the award winning Sonoma-Loeb portfolio of wines. Winemaker Phillip Titus hand crafts these wines using old world techniques along with modern methods to create truly exceptional Burgundian Style Sonoma County wines. Sonoma-Loeb Chardonnays are 100% barrel-fermented in French oak and remain in contact with the lees for up to eight months. While aging in barrel, the wines go through malolatic fermentation to produce the rich, buttery and rounded flavors noted in Burgundy�s most famous white wines. Further barrel ageing adds spicy oak and brioche aromas that add even more complexity and depth to the wine. The result is an opulent, sophisticated wine with a rich layering of textures, aromas and flavors accompanied by a long and satisfying finish. The nose shows lots of youthful ripe fruit as well as a very nice layer of oak and spice. Pineapple, melon and lemon zest are integrated with floral notes and a background of nutmeg and cinnamon. On the palate, the juicy rich flavors of baked pear, pineapple and lemon tart are heightened by the fresh and lively acidity. The wine is racy and delicious in its youth but built with the flavor and structure that will allow it to improve and gain in complexity with additional years of aging. Enjoy with classic chicken and pork dishes, fish, seafood and cheese. The wine is versatile and lovely as an aperitif. Reg. $24.99 NOW $19.97 or $19 on a 6-bottle buy Save 24%! Please come in and invite a friend.